When the trigger bar is completed, jBreakoutTrader looks for breakouts above the high price (buy breakouts) or for breakouts below the low price (sell breakouts) and it will place a buy/sell stop limit order depending on the direction of the breakout. 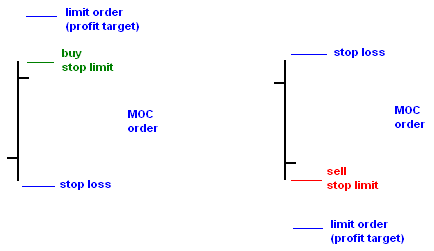 The stop price of the stop limit entry order is the high or low of the trigger bar; the limit price is at a configurable distance from the stop price (examples: for buy breakouts, if stop price is 10 the limit price could be 10.02; for sell breakouts: if stop price is 15 the limit price could be 14.95). The breakout entry order has attached a bracket order set (for profit taking and loss protection) and an optional market-on-close order (to avoid carrying the position overnight in case the position was not already closed by the bracket order). The profit taking order is a limit order. The profit taking order is placed at a configurable distance from the breakout price. The stop loss order is a stop order. The stop loss order price is placed at a configurable distance from the low price for buy breakouts (example: 0.03 lower than the low price) or from the high price for sell breakouts (example: 0.05 higher than the high price). The purpose of the optional Market-On-Close order is to be executed only at the close of the regular trading session, if neither the profit taking order nor the stop loss orders were triggered, to avoid carrying the position overnight. The strategy keeps a One-Cancels-All association between breakout order, target profit order, stop loss order and MOC order. only one set of orders will be created during the whole trading session, but if the first time interval did not create a breakout, jBreakoutTrader will monitor the next time interval until a breakout happens. Copyright © 2012-2019 Trading Software Lab. All rights reserved.